Here at Home Leisure Direct we have years of experience in buying and selling football tables, and will certainly be able to help you to find what you want and need from a brand new football table. We have created a range of videos that will inform every aspect of your decision, including make, model, size and more. Our videos will take you simply and easily through your options, allowing you to choose the right football table for your needs. For all the help you could need, we recommend watching our Football Table Buyer's Guide, presented by our managing director, Andy. 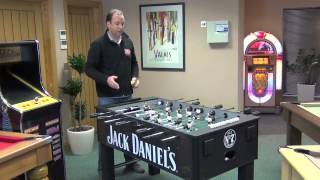 This video will help you to understand the choices involved in selecting a new football table, including the types of table available, sizes, key features and much more. Andy's guidance is invaluable in highlighting the important components and features that are common to all football tables, and will help you to find exactly the right one for you. Many of our customers are interested in seeing the process of installing a football table, so we have created some videos to show you exactly what's involved. Garlando, Bonzini and Sulpie are all covered in our selection of videos that will take you through the complete process of installation from start to finish. Sulpie are one of our most popular football table brands, and in 2017, The Discovery Channel were granted special access to Sulpie's factory in Cognac, France to document the entire process that goes into making one of their brilliant tables. You can see the real care and consideration that goes into every table, from casting the players in aluminium, painting the players by hand, constructing and finishing the cabinet as well as the final assembly. If you're considering buying a Sulpie football table, this video highlights the craftsmanship and skill involved in their creation and is a great indicator of their fantastic construction standards. After you've absorbed all of the information in those videos, we think you'll be much closer to making a decision. While there are a lot of football tables on the market, we think the huge number of tables we stock means that you're bound to find the perfect football table, and we'll do everything we can to find the one for you. This page is a great resource for buying a football table and will help anyone to reach a final decision. If you've watched our videos but still haven't come to a decision, feel free to contact our sales team by phone, email or in person. Our award-winning team have a wealth of experience and really know their stuff when it comes to football tables. With years of experience in table football, we can hold your hand as much or as little as you like. If you are concerned about your space, size of the table or whether or not a table will fit in your space, then you can either download any of our “Will It Fit?” guides or call the team who will happily help you over the phone. Of course, the very best option is to visit our Showroom to see our range, try them out for yourself and talk to our expert staff in person. We believe visiting us will be the most fun showroom visit you will ever have. Whether you're looking for a football table or one of our other fantastic games room products, we look forward to welcoming you soon with a freshly brewed cup of coffee and a truly enjoyable experience. Take our Showroom Tour to see what awaits you. If you need any help with purchasing a football table, choosing the right kind of table, or one of our other services, please call us on 01454 413636 or 0800 622 6464, or you can email us sales@homeleisuredirect.com, or why not visit our amazing showrooms - here's How to Find Us. How Sulpie Football Tables are Made A documentary look at how Sulpie's football tables are built, from moulding to assembly. Football Tables Buyer's Guide We take you through everything you need to know to choose the right football table for either home or commercial use. 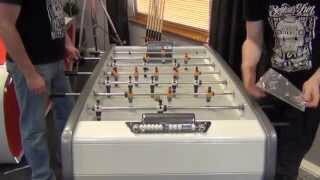 How to Install a Sulpie/Bonzini Foosball Table We show you how to install a Sulpie or Bonzini foosball table. Quick and easy! 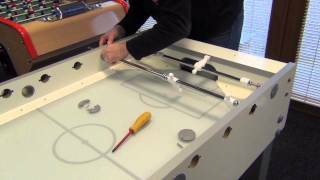 How to Install a Garlando Football Table We show you how to install a Garlando football table - the G-500.